Rajkot is assessing the need for reforms in its auto-rickshaw sector to improve mobility for all citizens. Photo by Satish Krishnamurthy. 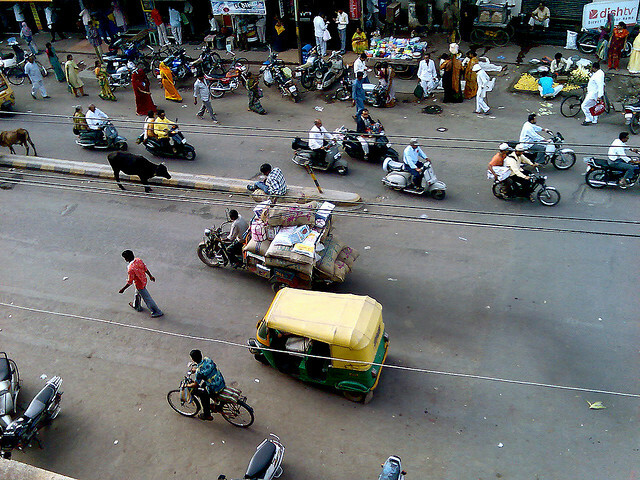 Rajkot is one of the fastest growing cities in India, with a population of around 1.3 million in 2011. Rapid urbanization and a growing economy have led to urban sprawl and increasing private motorization. The negative externalities of these trends, such as congestion, pollution and road fatalities, are affecting the quality of life of Rajkot’s citizens. Given these issues, it is imperative for Rajkot to adopt sustainable transport practices, using the “Avoid-Shift-Improve” strategy, to ensure a better quality of life for citizens, in terms of a faster and reliable commute, clean air and safe roads. The RMC’s solutions to improve auto-rickshaw services, in particular, will play an important role in enhancing the quality of life for Rajkot’s citizens. One of the key outcomes of the workshop was the need to promote organized fleet auto-rickshaw services in Rajkot, the benefits of which can be felt by drivers (i.e. employment benefits), passengers (i.e. improvements in quality of service), and the city, as a whole (i.e. mitigation of environmental impacts from current operations.) Fleet organization in the unorganized auto-rickshaw sector is an approach that involves providing service using a fleet of auto-rickshaws that are organized and operated under a unified brand name and image. RMC, in partnership with EMBARQ India, is currently working with a strategic partner to implement fleet auto-rickshaw services in Rajkot. This, coupled with the existing public transport improvement initiatives, will ensure that Rajkot has a high-quality integrated public transport system, which promotes mobility options for all sections of society.